Board Exam Medical Informatics -General Note on HOMI15-MethodsforDecisionSupport, created by Michael Riben on 08/18/2013. 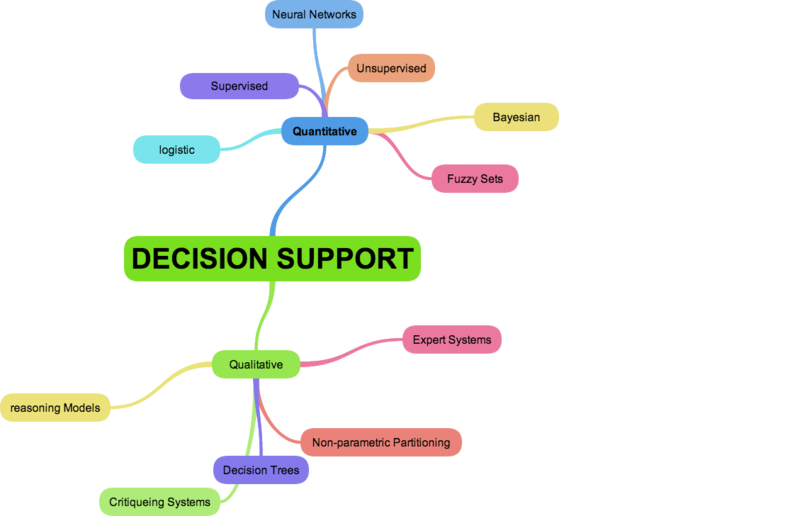 Intelligent decision support systems can help in multiple ways in clinical decision-making at both the individual patient level and the population level. For example: Diagnose by regularly interpreting and monitoring patient data. An IDSS can implement rules and patterns for individual patients, based on clinical parameters, and raise warning flags when such rules are violated. These flags can lead to clinical interventions that save lives. Help chronic disease management through establishing benchmarks and alerts. For chronically ill patients, a deviation noticed by an IDSS in, say, a blood test reading from a diabetic patient could result in an intervention before the patient gets into difficulty. Help public health surveillance by detecting pandemic diseases or in surveillance of chronic diseases. In case of a pandemic, an IDSS can interpret data and predict possible future spread of the disease. Additionally, IDSS can perform regular clinical decision support functions like preventing drug-drug interactions. Even if not noticed by the prescribing physician, an IDSS can spot incompatibilities between prescribed medications and/or dosages for the patient. Bayesian networks - combination of both quantitative and qualitative methods: imposes probabilistic models that quantify strengths of relationships among particular events. , these events in turn may appear in the model that defines particular states of the world and that uses either a quantitative (probabilistic) or qualitative (symbolic logic) reasoning methods. Figure 3: Contingency table and common performance measurements. 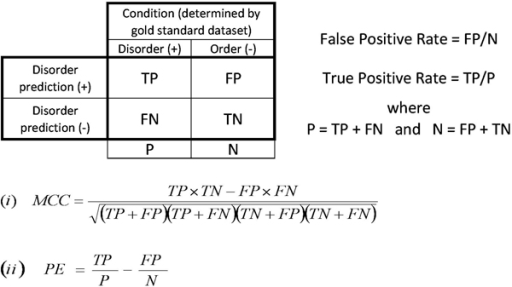 The abbreviations are for the number of true positive (TP), false positive (FP), false negative (FN) and true negative (TN) predictions. The False Positive Rate (FPR) was calculated as FP/(FP+TN) and the True Positive Rate (TPR) as TP/(TP+FN). The Matthews Correlation Coefficient (MCC) is shown in equation (i) and the probability excess (PE) in equation (ii). Imagine a study evaluating a new test that screens people for a disease. Each person taking the test either has or does not have the disease. The test outcome can be positive (predicting that the person has the disease) or negative (predicting that the person does not have the disease). The test results for each subject may or may not match the subject's actual status. In that setting: True positive: Sick people correctly diagnosed as sick False positive: Healthy people incorrectly identified as sick True negative: Healthy people correctly identified as healthy False negative: Sick people incorrectly identified as healthy In general, Positive = identified and negative = rejected. 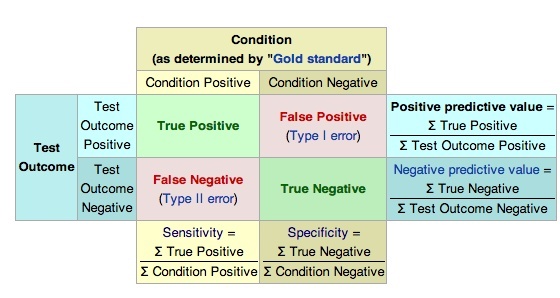 Therefore: True positive = correctly identified False positive = incorrectly identified True negative = correctly rejected False negative = incorrectly rejected In statistics and diagnostic testing, the positive predictive value, or precision rate is the proportion of positive test results that are true positives (such as correct diagnoses). It is a critical measure of the performance of a diagnostic method, as it reflects the probability that a positive test reflects the underlying condition being tested for. Its value does however depend on the prevalence of the outcome of interest, which may be unknown for a particular target population. The PPV can be derived using Bayes' theorem. Decision Threshold - depending on what is used can shift the FP and FN.We can Visualize this with an ROC curve. However, the two populations can not be minimized independently. In signal detection theory, a receiver operating characteristic (ROC), or simply ROC curve, is a graphical plot which illustrates the performance of a binary classifier system as its discrimination threshold is varied. It is created by plotting the fraction of true positives out of the positives (TPR = true positive rate) vs. the fraction of false positives out of the negatives (FPR = false positive rate), at various threshold settings. TPR is also known as sensitivity (also called recall in some fields), and FPR is one minus the specificity or true negative rate. In general, if both of the probability distributions for detection and false alarm are known, the ROC curve can be generated by plotting the Cumulative Distribution Function (area under the probability distribution from -inf to +inf) of the detection probability in the y-axis versus the Cumulative Distribution Function of the false alarm probability in x-axis.ROC analysis provides tools to select possibly optimal models and to discard suboptimal ones independently from (and prior to specifying) the cost context or the class distribution. ROC analysis is related in a direct and natural way to cost/benefit analysis of diagnostic decision making.The ROC curve was first developed by electrical engineers and radar engineers during World War II for detecting enemy objects in battlefields and was soon introduced to psychology to account for perceptual detection of stimuli. ROC analysis since then has been used in medicine, radiology, biometrics, and other areas for many decades and is increasingly used in machine learning and data mining research. Forward Reasoning -we start with the patient data from the patient database and then check the rules knowledge base whether there are any production rules that use the data to make inferences, if so, they are executed. The conclusions from these are added to the data set, and additional rules are triggered if they are dependent on the new data just added. =&gt; ALSO CALLED DATA DRIVEN REASONING. Once no more rules are triggered, program stops. Structure of a Knowledge base system --&gt;separation of case data , the domain knowledge, and inferencing mechanism. A knowledge acquisition program builds and maintains the knowledge base. May also contain "explicatory" module to help justify recommendations. Critiquing system - silent whenever the computer judges the users planned behavior to be satisfactory but offer a critique when the planned behavior proposed will take an action that is not consistent with decision support system . Computers can be misused in clinical Practice: users may not be qualified to use a system safely or efficaciously Users may be qualified but not trained well to use a system for its strengths and weaknesses Systems that work in isolation may be improperly tied to other systems or a network that provided erroneous or improper inputs Poor judgement of users in deciding not use a system when it should be used or not over-riding incorrect suggestions. Negligence Theory - service providers must uphold the standards of the community for quality and reliability in delivering services. if not, they are liable in a court of law. Strict Product Liability - applies when the purchaser of a product is harmed from a defect in the product= Standard is perfection when injury is concerned.